my new favorite fabric…little folks voile! This quilt turned out even better than I had hoped! We’ll call this the first finished quilt of 2010 (it’s actually the third, but since I have yet to show you the first two, this can become the first). As I mentioned in this post, I decided to use prints from Anna Maria Horner’s Little Folks line, specifically the prints from the Playground palette, with a few extra blues added in for good measure. I did a simple patchwork design, with 3.5″ squares. And then I went for simple straight line quilting, sewing diagonally through every other square. I added a second stitch line to every other line because I just love the look of a double stitch line! I was really feeling a white backing, so I went with Kona Snow for the majority of it, adding in a vertical strip of the extra voile squares. This white backing with just a few squares really makes me really happy. So does that pattern the quilting makes. Oh, and for those who have asked, I do use a walking foot for the straight line quilting. I don’t have a double needle though, so when I do a double quilt line, I just do a second line about 1/4″ away from the first. A few of you commented that you wondered how the voile would be in a quilt, and I’m here to tell you that I think it’s wonderful. It’s truly the nicest-feeling quilt that I have. I kinda wish I had made it my size (this one is about 37″ x 43″, so more baby-sized than Ashley-sized)… although then I probably would have spent all my time laying under it on the couch! I only had two small problems working with it, but they’re really minor, so don’t let that deter you… first, I had a bit of trouble determining the right side of a few of the fabrics. This might be the only fabric I own where the back is almost as nice as the front! I had to get a second opinion from Morgan on a few of my squares before sewing them together (see, minor!). My second issue was in basting… not my favorite part of quilting. I use spray adhesive so I can get it over with faster, and unfortunately, spray adhesive doesn’t seem to adhere to this fabric! I don’t own safety pins, so I had to resort to straight pins. And any of you who’ve tried this will know that it’s a bad idea. I stuck myself more times than I’d care to recall. Otherwise though, I’m totally in love, and already planning the next one. Probably in the Moonlight palette. Yes, definitely. This entry was posted in [search] Charm Quilts, 2010 Finished Quilts, Finished Quilts, Posts about Quilts, Quilts and tagged anna maria horner, little folks, patchwork, quilt, quilting, squares, voile. Bookmark the permalink. you can’t go wrong with goldfish, right? 43 Responses to my new favorite fabric…little folks voile! Have you done any posts on how you quilt? Now I know you make your “sandwich” with spray adhesive, but I wonder do you use a walking foot on a regular machine? I’d love to hear more details… Should I post this over on the flickr discussion page? On this fabric – I thought it was flannel – I’m not sure what voile is. Really beautiful. And I love the backdrop of the snow. Makes the colors pop. Gorgeous. I think I might do this with my AMH flannels. When you straight line quilt, do you use a walking foot or are you doing it with a free motion foot? I have a hard time with lines and maybe it’s also an issue with my basting..
Lovely quilt though and I can hardly believe you’ve made three quilts already this year?!? 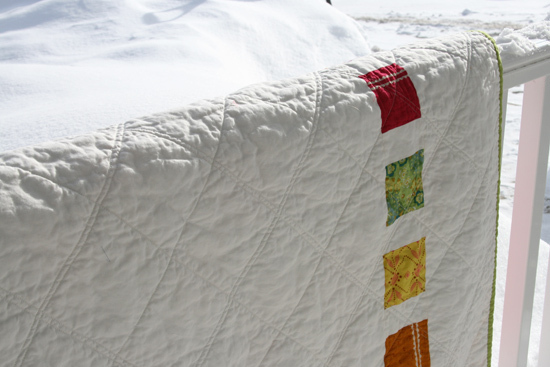 I guess I’m not the only curious one – how do you straight line quilt? A walking foot? I have a hard time with lines; maybe it’s also an issue with my basting..
That turned out soooo well! Beautiful, as all of the quilts you do are! Curiously, when you do the double stitch lines, do you use a double needle for those or do you do one and then the other right next door? Your stitching is so perfect, it’s hard for me to tell! Wow – beautiful!!! And I can’t believe how fast you are. Really – your 3rd quilt so far this year!?! I’ve only tackled an apron so far … ha ha ha. This is beautiful! I might have to get some of this! I cringed a little when I read you’d used straight pins to baste because I can only imagine how many times you got stuck! Ouch. Scrumdillygorgeous! Just wondering, what batting/wadding did you use??? THis quilt turned out GREAT!!!!!! Just like i was sure it would. Great job! All the fabrics look awesome. I also am a fan of the back. The color really pops against the solid white. LOVE IT!!! I can’t believe it’s done! I ordered my fabric on the day of your first post and haven’t even gotten it in and you’re already done with yours! It’s gorgeous. This turned out great! I do love the white backing too. Thanks for the tip about the spray basting not working. I hate pin basting too! And yes, straight pins are horrible to baste with – pokes everywhere – poor thing! Beautiful! I love how you photographed it in the snow. I LOVE THIS! I think Anna Maria Horner is my favorite designer. I really haven’t found a pattern of hers that I don’t like. What is Kona Snow? Is that a specific brand of white, or a description? Thank you! this quilt is so fabulous, ashley! your quilting continues to amaze me. the voile puts it over the top. 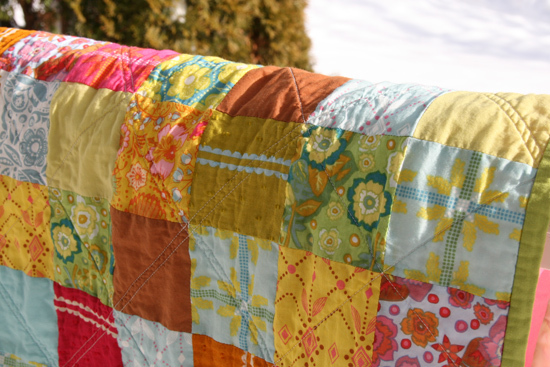 thanks for sharing…this quilt makes me smile. beatiful I can’t wait to get some of that fabric. I noticed at my local quilt shop tonight that they have quite a bit of Katie Jump Rope left, isn’t that a line that you like? Anyway, don’t know if you need any, but email me if you do. I’ve been trying to resist the little folks fabric (because I’ve bought way too much lately)… but I’m failing miserably after reading this! May I just say, it’s even better in person. Anna Maria’s voile fabrics are SO soft, they’re kind of irresistible – I want some, and I don’t even quilt or sew! Gorgeous quilt, as always. And yes, the one change I would have made was to make it bigger! Although, best not to tempt oneself, eh? 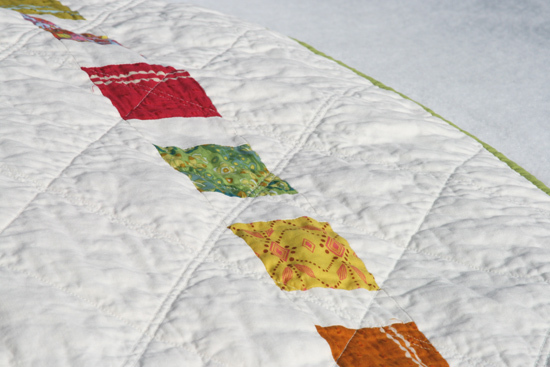 Oh you are warming my soul with a quilt from my voiles- such a beautiful job as always, and I am thrilled to see that you are enjoying these goods. It was a shout it from the mountaintops moment when I first received them, and you really just can’t know it till you feel it. Thanks for spreading the love and Happy New Year to you! Thanks for taking the plunge and making a quilt with these, now I’m going to have to go order a stack… I’m a little in shock that you don’t own safety pins!!! Love it! You pick the best fabric combinations. I really need to step it up in that department. 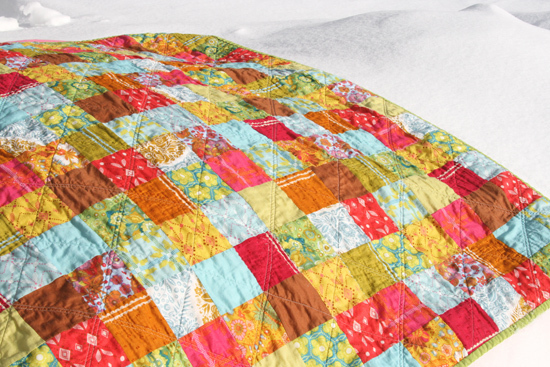 I need to ask a favor – how big would you recommend making a quilt for a twin size bed? I am thinking 68×88??? But then I am totally unsure of how much fabric to buy for the backing. Any suggestions. I usually just make baby quilts or lap quilts and just make them whatever size I want. It’s hard to do things the right way! Ashley, what green fabric did you use for the binding? I’m doing a string quilt using the black and white and I’m thinking that green is a good green to use. Mmm. Gorgeous. Just ordered some of those for myself. I can’t wait to feel them. Your quilt is beautiful. This is really beautiful, I just made a top from the honey ink voile and it was beautiful to sew with. I had exactly the same problem with deciding which side was which, not a fabric to sew with in bad light! This is one of my favorites of yours. Really beautiful. And for #28, Whitney, I don’t quilt or sew, but I do own a lot of old quilts, with varying sizes. My suggestion on sizing for you is that you measure the bed you are thinking of, and add inches based on how much you want for the hanging-down and ends. Some folks want more on the sides, others like to leave the pillow on top of the quilt, while others want the pillow covered by the quilt (this will also depend on how stiff the quilt is). I’d be tempted to do something in the 87″x65″ range, which is pretty close to what you are thinking of. Maybe rip up an old sheet and see what looks good before digging into the real fabric. Hope that’s helpful. This quilt is beautiful! I love looking at your work –it really is inspiring! Ashley, this is a beautiful quilt. I haven’t cut into my set yet, I was wondering if you had trouble with the colors bleeding when you washed it – it certainly doesn’t look like it. I guess I’m just wondering if my good luck run with not prewashing fabric (I hate it with a passion) would continue when I use it! My blogging partner and I have been talking for a while about adding a sidebar feature for things we love, and when I saw this I decided it was time to kick it off. I love love love it! what an absolutely stunning quilt! you have me completely sold on the little folks voile, too. now off to pick some up for myself! 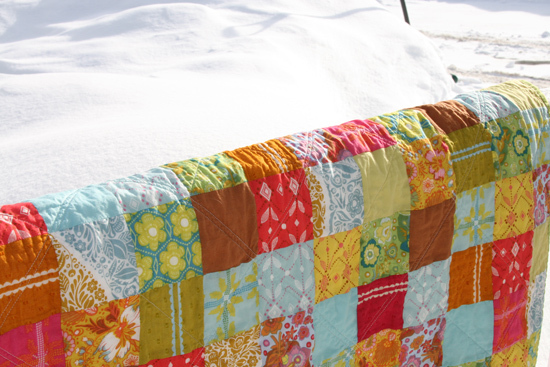 I am considering making this patchwork quilt for my twin beds. Do you purchase a pattern for it, or did you just cut a bunch of 3.5 inch squares and sew them together creating 3 inch squares? 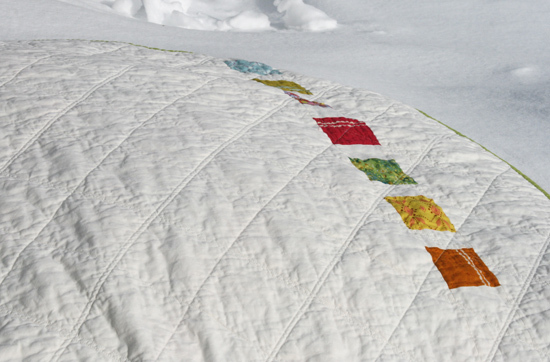 What is your preferred batting for your AMH Little Folks voile quilts? 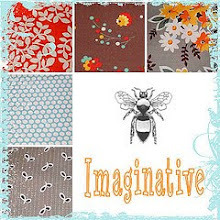 I have a quilt in the works using these fabrics and can’t decide what batting I want to use. Just found my way over here while searching for simple square quilt pics. Wonderful – wonderful blankets! I am sooooooo inspired and sooooooo excited to read more of your blog. 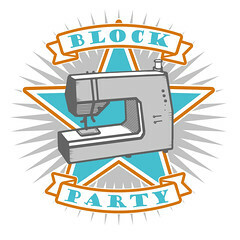 This is a new creative field to explore for me (actually forced on me as I am sufferin g from a aching elbow from to much crochet and computer work…)and I am eager to learn from scratch! Wow! I’ll be back soon. Thanks for sharing, and I did borrow some pics and linked them back to yours on my blog. Hope that is okay… Let me now otherwise and I’ll take them off in flash. Annette over at My Rose Valley.